Press Release 15 October 2018 – Cabinet Secretary meeting and AGM panel includes Lamont and Wheelhouse. Frank discussions with Transport Secretary ahead of Campaign AGM including political heavyweights Lamont and Wheelhouse. The Campaign for Borders Rail (CBR), which is building on the success of the Borders Railway and seeking extension through Hawick to Carlisle, has met with Scottish Government minister Michael Matheson, Cabinet Secretary for Transport, Infrastructure and Connectivity, ahead of their Annual General Meeting in Hawick on Saturday 20 October. A CBR delegation met in Edinburgh with the recently appointed cabinet secretary, to raise awareness of campaign issues, and to take a briefing on the current government position regarding infrastructure development, with particular relevance to extending the Borders Railway. The Campaign reiterated its invitation to the their “Question Time” style public debate at the AGM. Simon Walton, the Campaign’s chair, said the meeting was productive, and allowed both sides to express their positions. “The fact that we are around the table, discussing options for extension, rather than still trying to argue the case for the railway, shows how far we have come,” he said. The Campaign’s Annual General Meeting is this Saturday (20 October, 1300-1600) in Hawick High School. The highly-popular “Question Time CBR” panel has been finalised with six prominent figures answering questions from members and the public. They are: John Stevenson MP from the Borderlands Growth Initiative; John Lamont MP for Berwickshire, Roxburgh and Selkirk; and Paul Wheelhouse, MSP for South Scotland and ministerial deputy for Transport, Infrastructure and Connectivity. Local government is represented by Shona Haslam, leader of Scottish Borders Council. Community and commerce are represented by Brian Eaton, academic in the subjects of transport and tourism at Edinburgh Napier and Hong Kong universities; and Richard Morris, chairman of the Friends of the Carlisle and Settle Line, often regarded as the sister railway of what was the “Waverley Route” through the Scottish Borders. The AGM’s “Question Time” session is open to the general public, with doors open at 1415hrs. 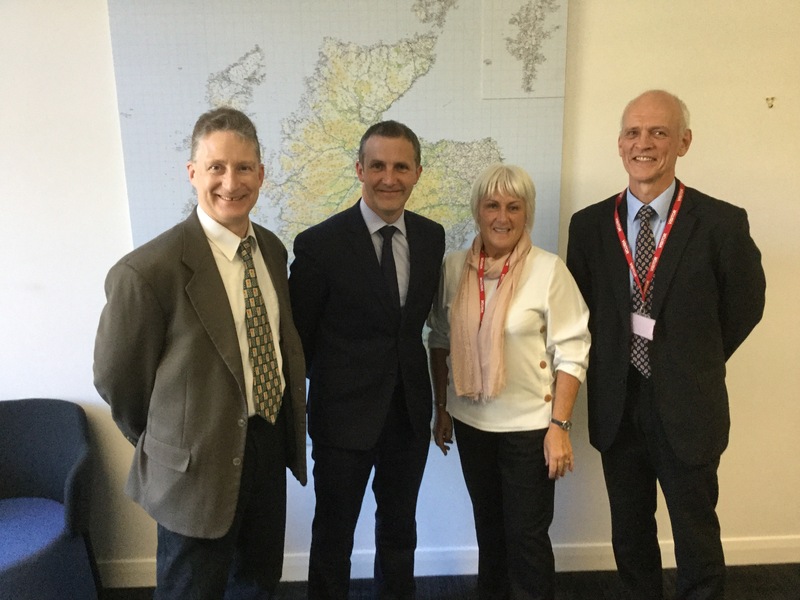 IMAGE: L-R Simon Walton, CBR Chair; Michael Matheson MSP, Cabinet Secretary for Transport, Infrastructure and Connectivity; Marion Short, CBR vice chair; Robert Drysdale, CBR committee.